Today was a busy one. I helped with one of our two annual bison roundups (one for each herd) at the Niobrara Valley Preserve. We brought about 500 bison in from the hills, ran them through a corral system, and sorted the ones to be kept from those to be sold. It was a cool and cloudy day, but the predicted rain held off until the last two hours, and we got everything done by late afternoon. I always love the chance to see these animals up close, and to listen to the sounds of pounding hooves and bison grunts. Portrait of a bison cow in the corral. The Nature Conservancy’s Niobrara Valley Preserve. I will post more photos from the Preserve next week, but I’ve just got time to post this one before I head to supper and then bed. 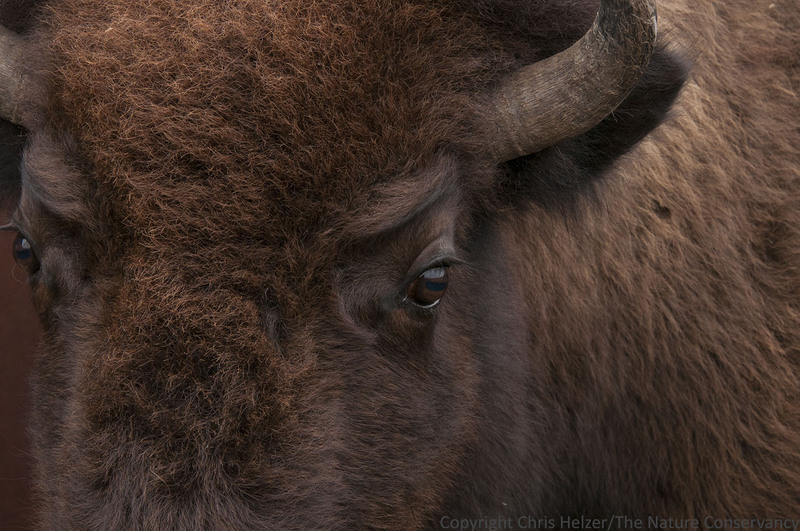 This entry was posted in Prairie Animals, Prairie Photography and tagged bison, corral, niobrara, roundup, the nature conserve by Chris Helzer. Bookmark the permalink. Thank you for taking the time, she’s a beauty. What an incredible experience that must be. I admire how you make the simple and mundane so profound. As a consequence, this is one of my favorite blogs. Thanks for that. Love buffalo. A true & magnificent icon. Thanks for sharing! Incredible animals. We’re so lucky not to have lost them in the 1800’s. Looking at these beautiful animals makes me so sad to think about the dismantling of the prairie ecosystem. Not to mention the loss of the dozens of species of megafauna (mammoths, mastodons, giant ground sloths, camels, cave bears, dire wolves, sabertooth cats, etc.) that occurred 10,000 years ago, possibly also with the help of humans.